The customer service we received from Northern Refineries was extremely high standard from start to finish. We received e-mails when they received our package of industrial platinum. Our settlement return was prompt. Keep up the excellent service. 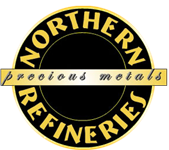 Northern Refineries is the company to use for all your precious metal refining needs. They are fair and honest. Thanks for your great service and honesty! Respect and honor are scare today. Thank you for having it. I took a chance on your company and was not disappointed. Great service, great yield. Stuart was very informative and e-mailed me when he received my shipment of gold. They are my refiner of choice for all my precious metal scrap. Our company has had a long-time relationship of professional and personal service. I highly recommend Northern Refineries for all your precious metal refining needs. Northern Refineries is number one. I have been using them for several years and have never been disappointed. Stuart e-mails me when he receives my shipment and calls with my settlement return. You are the only platinum refiner we will ever use. Thank you for your fair and honest settlement returns. Just as I do sometimes with ebay, I get antsy awaiting items and contact the seller the day before the item arrives. So it was with the settlement check for my Pt/Rh [Platinum and Rhodium Thermocouple] wire. Check arrived along with gratuitous coin (thank you for that). Great doing business with you. As a closet composer myself, I connect somewhat with your musical background (my voice teacher in college said I was the best natural baritone voice he had ever taught); and I am working on transitioning to doing professional voice over work.